If there’s one thing that can be said about Italians, it’s that they know good food. The cheese, cured meats, olive oils and pastas from across the region are second to none, the recipes are as drool-worthy as they come, and we don’t know anyone who doesn’t crave a creamy panna cotta or slices of salumi on the regular. But where do the island’s Italians get their fix of just-like-nonna’s nosh, we hear you cry? From a family of fellow Italians, of course! 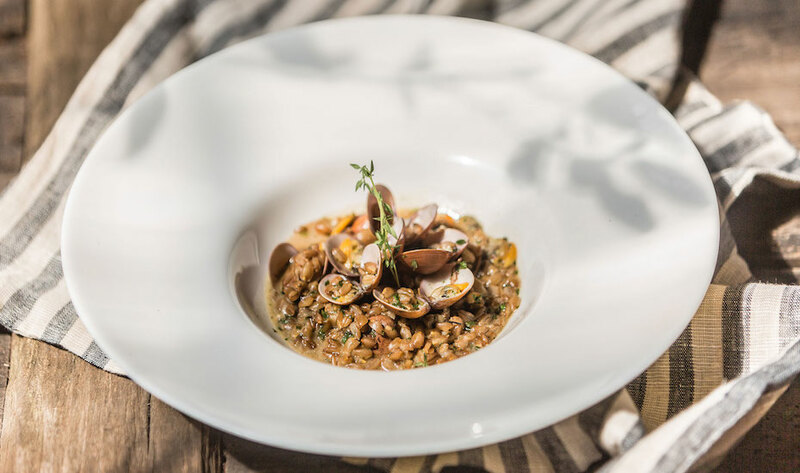 And that’s where Zibiru and Bottega Italiana step in – two of Bali’s very best Italian brands that bring the “boot’s” classic dishes to Bali with a farm-to-table, from-scratch approach. From the tender-to-the-touch tagliata at Zibiru to the homemade croissants, pastas and sauces at Bottega Italiana, these scrummy sisters are without doubt two of our fave names when it comes to tucking into Italy’s greatest creations. Here’s why you need to add them to your Bali hit list, stat. The Godfather. The mothership. Zibiru is where this scrumptious success story begins, back when its whitewashed, hand-carved doors opened in the summer of 2012 by Executive Chef Luigi Calcagno. Since then, this quaint and cute open-air restaurant has been blowing the island’s Italian fans away with farm-to-table, made-from-scratch cuisine – all of which preserves classic recipes and artisanal techniques that have been used in Italian homes for hundreds of years. You see, Zibiru began because of Chef Luigi’s love of food, and not only what’s created in the kitchen. He carefully sources fresh-from-the-net fish each day from the Jimbaran market, he uses only organic vegetables from Bali’s best farms, and all of the rabbit, poultry and pork served in the restaurant is pasture-raised. But he doesn’t stop there. The chefs also home-make their own fresh cheese, breads, focaccia, croissants and bombe, they handcraft all of the pastas from scratch using age-old techniques, and all meats are carefully house-cured in the classic way. Nothing is bulk bought, and no details are overlooked where quality is concerned. Sounds pretty complex right? Well, Zibiru is actually all about simplicity, using only a handful of ingredients in each dish to really let the premium produce and authentic flavours from the regions shine. Take the Tuscan-style cured meats with salted ricotta cheese and pot of honey.Or the pillowy-soft gnocchi from Umbria with homemade sausage, black pepper and a white wine cream sauce. Or our fave, the Pistachio-flavoured pasta with house cured and smoked salmon, white wine, chives and a homemade pistachio cream. Delizioso! Zibiru Restaurant, Jl Drupadi 7, Seminyak, p. +62 361733625 or +62 822 36631302, e. info@zibiru.com. Open daily for dinner from 5pm to midnight. If the sound of Zibiru had you begging for a-more, then you’ll be pleased to hear that Bottega Italiana follows in the same scrumptious footsteps as its predecessor – and better yet, there’s three yummy locations for you to feast at. Taking a slightly different approach to Zibiru, Bottega Italiana is more of a fast-casual Italian eatery that takes the back-to-basics philosophy a step further. It showcases the best of what Italy has to offer with its all-homemade and premium, organic ingredients, with some recipes using just three simple ingredients. Yup, we’re talking about the pomodorino e stracciatella sauce that’s just cherry tomatoes and basil from Bottega Italiana’s own edible garden, mixed with a homemade, soft “fior di latte” cheese. It may only use a few simple flavours, but they pack a seriously scrummy punch. And by popular demand from Zibiru’s ever-growing loyal following, Bottega Italiana also stands as a boutique gourmet marketplace for you to purchase homemade products to take home – not only fresh pasta, sauces and herb-infused olive oils, but salumi, wine and authentic cheeses, made both in-house and imported direct from Italy. It’s no wonder then that just this week, Bottega Italiana opened up its third location on the island, this time in the heart of pumping Petitenget. Each of the three Bottega Italiana’s are named after herbs found in Italian cooking, and Timo Bottega Italiana (thyme) is the moniker for this new address, after Basilico Bottega Italiana (basil) in Seminyak and Rosmarina Bottega Italiana (rosemary) in Canggu. And psst! To celebrate this new Bottega hot spot, stop by for a glass of vino between 4pm – 6pm any day of the week, and you’ll be treated to classic, Italian-style aperitivo… Salute! Bottega Italiana Bali, ‭Petitenget: Jl. Petitenget No.777, p. +62 812 36552505‬ // Canggu: Jl. Pantai Batu Bolong No.77, +62 822 3611 1011 // Seminyak: Jl Drupadi 7C, p. +62 822 36631302, e. hello@bottegaitalianabali.com.